Last winter I wanted fresh, season appropriate salads. This year all I want is a hot steamy bowl of soup, and what better to star as the leading lady than the potato? 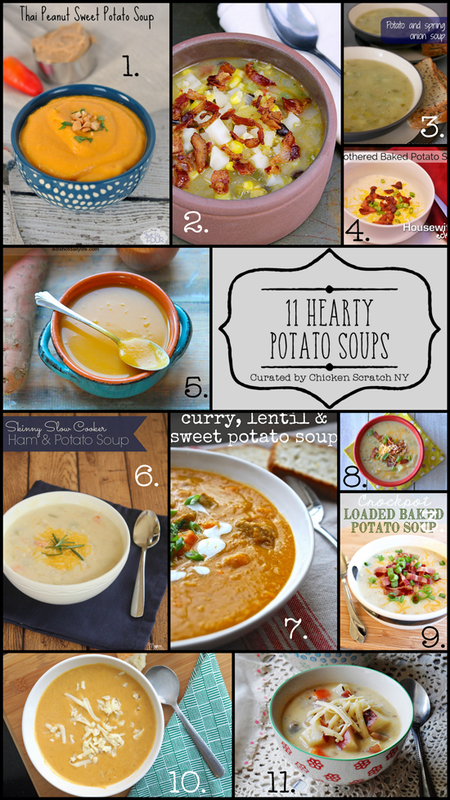 This collection includes the standard white potato and (my favorite) the sweet potato! Pick up your soup spoon and get ready to dig in. 1. Thai Sweet Potato Soup from Just Us Four Blog – When I was in college I ate so many Thai peanut noodle dishes, the combination of peanut butter and spice is delightful. This soup takes it one step further by adding in sweet potatoes. 3. Potato & Spring Onion Soup from Amuse Your Bouche – If you’re confused by the inclusion on ‘spring’ in this very wintery mix of hearty soups, don’t be, apparently it’s another name for scallions. I love her tips on getting the perfect potato soup texture. 4. Smothered Baked Potato Soup from Housewife Eclectic – This smothered version of backed potato soup is topped with cheese, green onions and bacon. It’s comfort food at it’s finest. 5. Butternut Squash & Sweet Potato Soup from A Dish of Daily Life – This dish combines three of my favorite foods, sweet potatoes, squash and apple cider. It’s a guaranteed slam dunk! 7. Curry Lentil Sweet Potato Soup from Life Over Easy – Look at the color! How do you not want to eat it? My husband loved curry more than he hates non-white potato vegetables so I’m pretty sure I could even get him to eat this. 9. Crockpot Loaded Baked Potato Soup from Happiness is Homemade – Crockpots are a life saver on busing evenings, this version of the popular baked potato soup uses one to keep the work to a minimum. This one also features shallots which are one of the most magical foods ever. 11. Rustic Garlic Potato Soup from Amanda’s Cookin’ – How do you make garlic better? You roast it. How do you make potato soup better? You put roasted garlic in it! Thanks for sharing the recipe! I can’t wait to battle my husband over the hotness level on this one, he’d eat a firecracker and tell me it was mild haha! thanks for featuring my soup!! these all look so good! pinning! Thanks for sharing your recipe! I love roasted sweet potatoes and I seriously considered driving to the store for ingredients at 8 pm on a Sunday so I could make this soup! No worries! We’ve all been there. I don’t have little ones anymore but I remember those days well! I appreciate you including me! I love these soups you’ve shown. Give me potato soup over any other. Great collection! Sorry I still can’t get to G+ even from here.